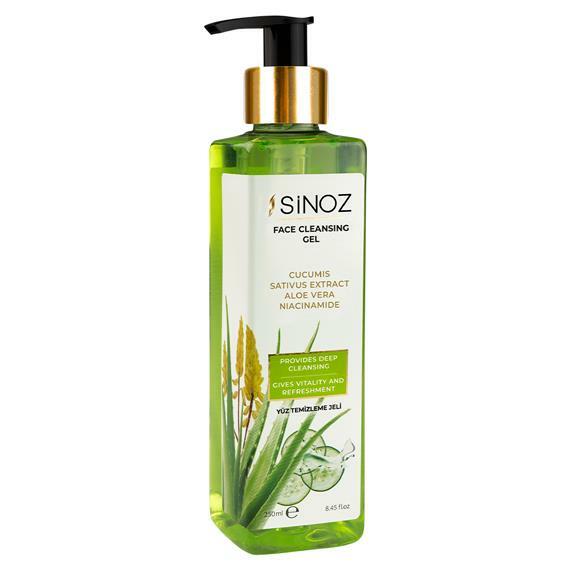 Deep cleansing for smooth and radiant skin with sinoz Facial Cleansing Gel. Helps remove makeup residues by cleansing the dirt and grease on your skin and opening the pores. The gel is able to prevent acne formation by stopping bacteria formation on the skin. It can moisturize and protect the skin due to the cucumber extract. Sinoz Facial Cleansing Gel does not cause side effects such as redness and exfoliation. Thus, it is suitable for all skin types. Daily before bedtime, squeeze a quantity of the product in your palm and add a little of water to form a foam and then apply to your face by massaging it, except the eye area. Then, rinse your face with plenty of water. You can use it twice a day (morning and evening).